God led His people into the wilderness, but He did not leave them there alone. The Lord was with His people. He provided meat, bread, and water. He guided them to Mount Sinai, where He met with their leader, Moses. The Lord came down on the mountain in fire, and He spoke through thunder. The Israelites could not have ignored His presence. God punished His people for worshiping a golden calf, and Moses returned to the mountain to ask the Lord to forgive the Israelites’ sin. 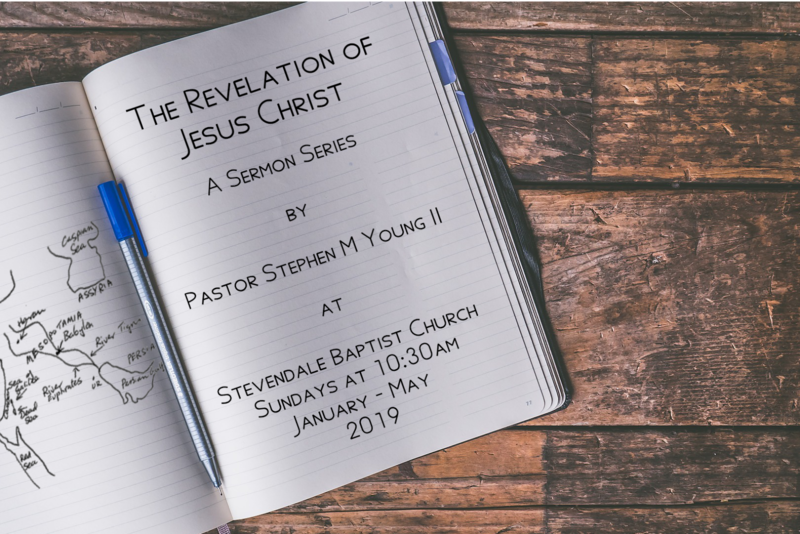 Moses could not atone for the people’s sin; God said He would hold the people accountable for their sins, but the Lord did not abandon the Israelites. Introduce your children to the concept of idolatry. An idol is anything a person puts in the place of God. Explain that idolatry is a sin. The Israelites deserved to be punished for their sin. In the same way, we deserve to be punished for our sin. Point out that God’s people sinned against God, and Moses asked God to forgive them. 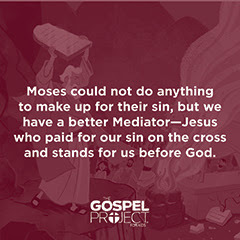 Moses acted as their mediator, standing for them before God. 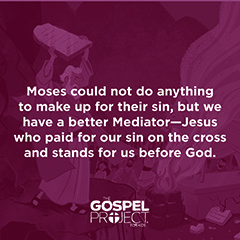 Moses could not do anything to make up for their sin, but we have a better Mediator—Jesus. Jesus paid for our sin on the cross and stands for us before God. When we trust in Jesus, our sins are forgiven. ○ God’s people worshiped a calf made of gold. ○ Moses asked God to forgive the people. ○ God forgives people through Jesus. ○ What is worship? Worship is celebrating the greatness of God. ○ God’s people worshiped a golden calf. ○ God disciplined His people for worshiping a golden calf.